If Hugo Weaving has his way, Marvel Studios won't be reprising his Red Skull role for Captain America: Winter Soldier. 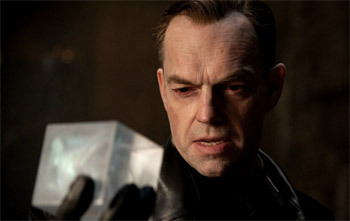 Hugo Weaving has starred in an impressive number of geek-friendly films over the course of his career. After coming to mainstream attention as Agent Smith in The Matrix, Weaving went on to represent the likenesses of several highly recognizable characters, such as Elrond from The Lord of the Rings, V from V for Vendetta, and even Megatron in Michael Bay's Transformers. Many roles lent themselves well to additional performances in later sequels, but Weaving has now stated that there is one character he never wants to return to: Hydra Commander Red Skull from Marvel Studio's Captain America. "I think I've done my dash with that sort of film," Weaving said. "It was good to do it and try it out, but to be honest, it's not the sort of film I seek out and really am excited by. As an actor, to do all sorts of different films is great. It stretches you in different ways. But, I increasingly like to go back to what I used to always do, which is to get involved with projects that I really have a personal affiliation with." Despite his reluctance to return to the role, Weaving does acknowledge the possibility that he could be forced back into the mask anyway. "I did sign up for a number of pictures and I suppose, contractually, I would be obliged to, if they forced me to, but they wouldn't want to force someone to do it." Weaving isn't very concerned about that contractual obligation however, because he believes that Marvel is unlikely to bring the villain back for a sequel. "I think the tendency, with those films, would be to probably not bring a villain back. They might for The Avengers, but I didn't think I'd be in Captain America 2 or 3. I don't think Red Skull will be there. And it's not something I would want to do again." While I certainly respect Weaving's sentiments, the news is somewhat disappointing. Not only did Weaving provide an excellent performance in Captain America, but the Red Skull is also a major figure in the Marvel Comics Universe, equal to villains like Doctor Doom or Magneto. Bringing back the Red Skull to battle the Avengers in future movies is an intriguing prospect made difficult by Weaving's absence. If Marvel were to return to the Nazi-inspired villain, it's hard to imagine another actor who could perform the role quite as effectively.